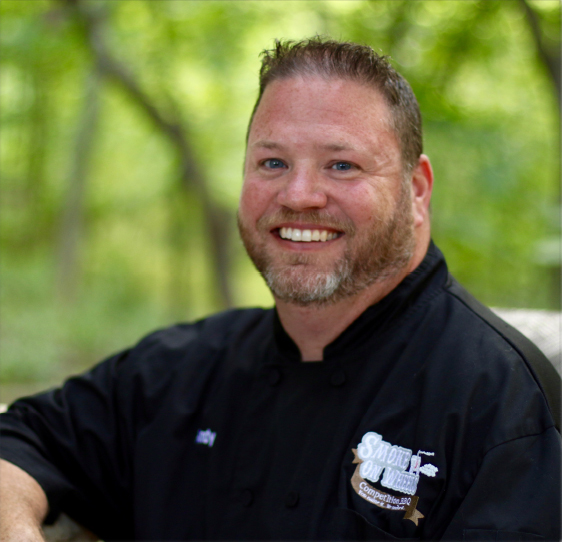 Chef Aaron Mizrahi is an authority on live fire cooking as well as an authority on all meats. 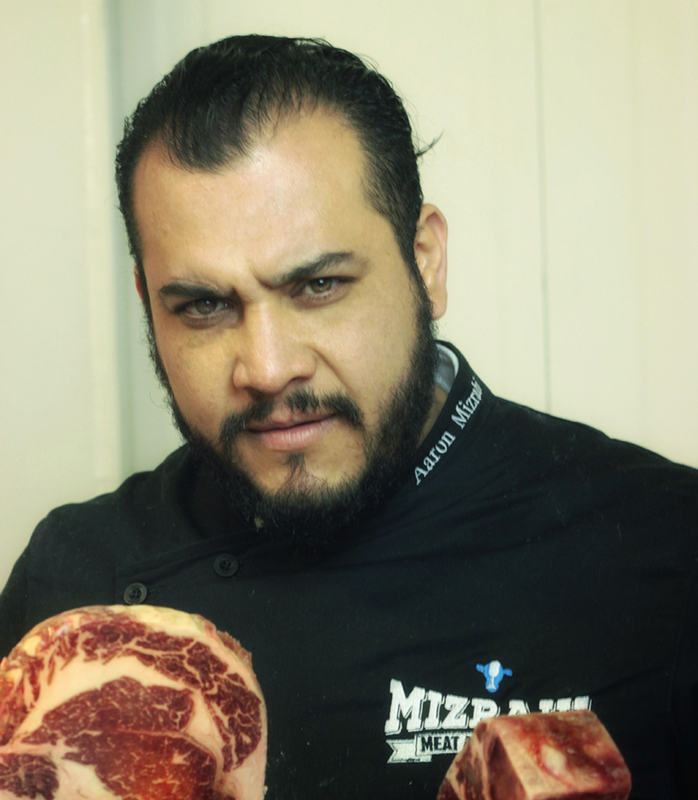 He is a Creekstone Farms Premium Black Angus Beef International Brand Ambassador, Corporate Executive Chef at Grupo Almos and Chef at Mizrahi Meat Authority. https://dev-operationbbqrelief.org/wp-content/uploads/2017/08/JohnDavidWheeler.jpg 480 480 OBR https://operationbbqrelief.org/wp-content/uploads/2017/03/obr_horz-300x84-2-300x84.png OBR2017-08-19 00:17:132017-08-20 14:37:30Memphis Barbecue Co.
Boars Night Out started in early 2006 as a group of single guys that were all recently divorced. Throughout 2006 we were known as the team that liked to cook, and a team that could definitely throw a Championship Level Party! 2007-2009 were maturing years for the team. We picked up some first place trophies mostly in the Desert category. The Party was still the focus of the team and we knew something had to change. We made the team decision to shift our focus to becoming world class purveyors of the BBQ world. 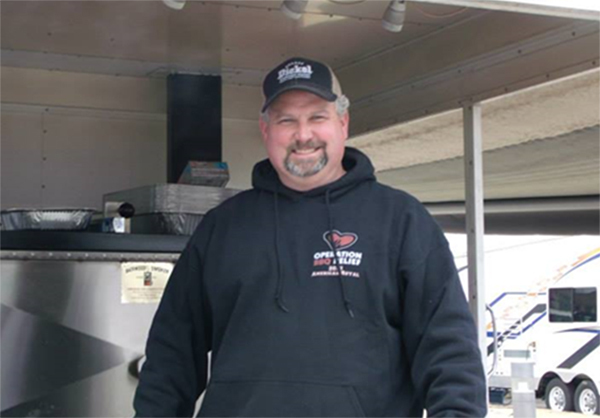 In 2010 our focus shifted from the Party to preparing world class BBQ. We knew to compete at the highest level we needed a larger cooker. We collected our wish list and began construction of a new customized trailer. The only thing ordered for this trailer was the axles. Our 37-foot gooseneck trailer was truly custom built from the ground up incorporating ideas and suggestions from team members and respected cooks and friends from the BBQ community. 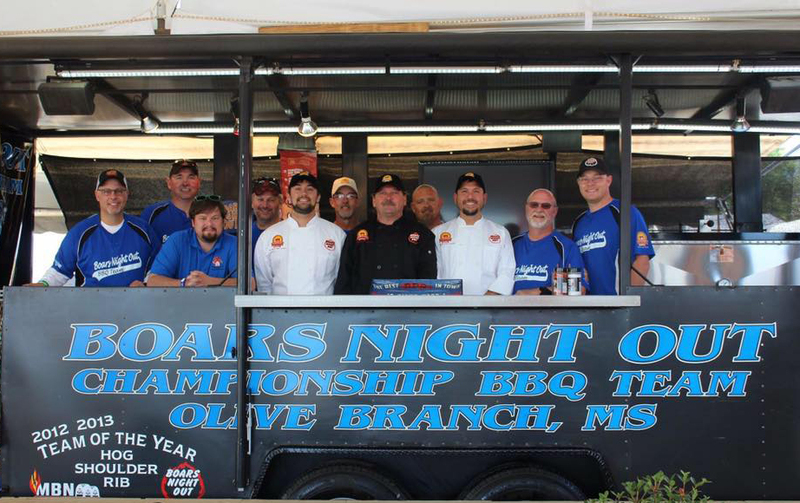 These, along with several 2nd, 3rd, and 4th place finishes in other categories, and then to top it off with a 5th place finish in the points for the Memphis BarBQue Network and gained respect from fellow competitors. In 2011 we continued to refine our processes. We worked on our presentations by matching our team member’s talents with the various tasks necessary to compete at the highest level. We were definitely focused and intent on accomplishing our goal to be at the very pinnacle of Championship BBQ teams in the world. In 2011 we traveled to Ottawa Canada and hosted the 4 th of July Celebration for the US Ambassador to Canada. Needless to say we were quite proud of this privilege and honor. We also purchased a commercial cooker enabling us to Cook for all types of civic events, fundraisers, catering jobs, etc. There is no event to small or too big for Boars Night Out! 2012 was the year where our focus and hard work finally paid off. Our team had matured, our attention to the smallest detail was where it had to be, we were totally focused, and our intent was to win against all competitors and to become the MBN Team of the Year! 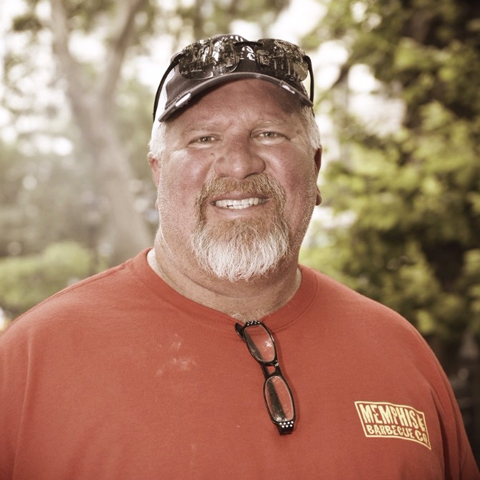 Jamie was born and raised in Kansas City, Missouri—”The BBQ capital of the world”— and spent his high school years working for one of the best BBQ restaurants in that city. Upon graduation, he joined the Navy and was always on the lookout for great BBQ throughout his travels across the U.S. and abroad. Jamie took his insatiable love and talent for food and became a professional competitive eater (personal best: 318 chicken wings in half an hour). 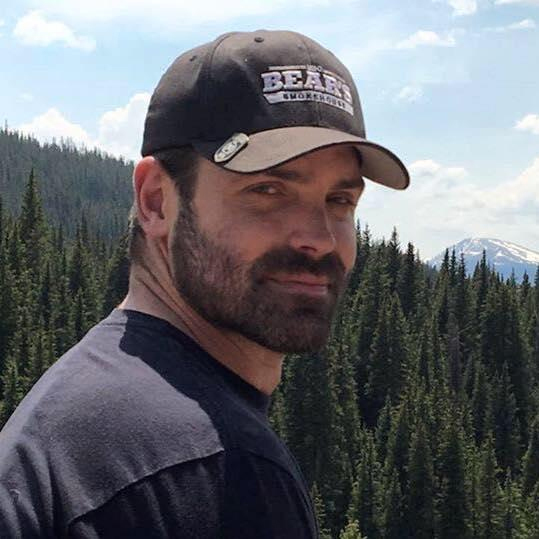 With his winnings, he opened Bear’s Smokehouse, in Windsor, in 2013. 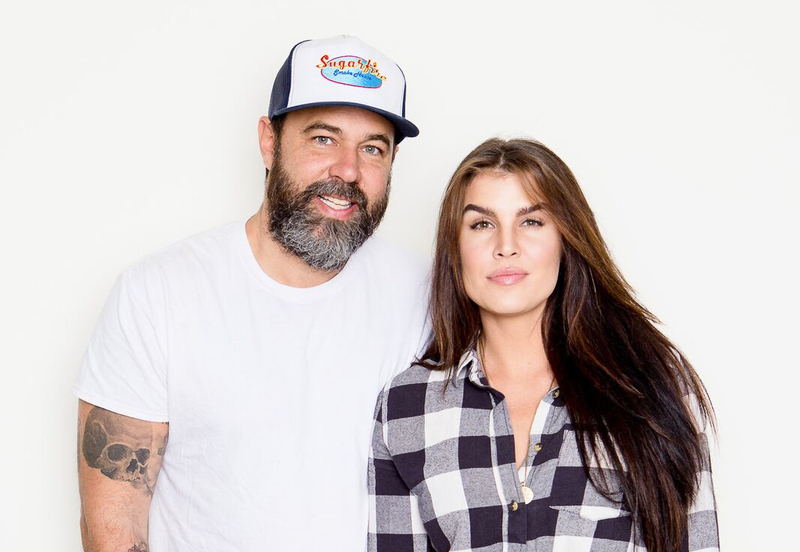 Soon after, he entered another contest sponsored by the web-hosting company GoDaddy, in which finalists pitched business ideas to racecar driver and firebrand, Danica Patrick. Jamie’s idea won and he used the prize money to expand his BBQ empire which is continuing to grow through new partnerships like the UConn Huskies and the Hartford Riverfront Recapture organization. 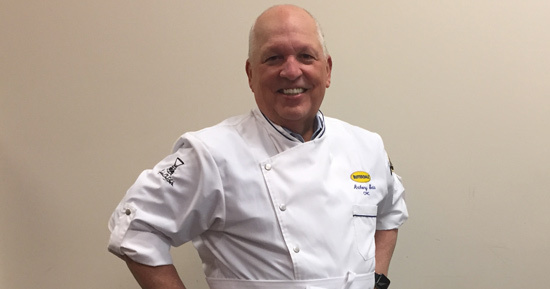 Soon to open his 4th location, his restaurants use a staggering 25,000 lbs of meats a week. His goal is to elevate Hartford in the eyes of BBQ aficionados everywhere. Jamie is committed to a mission of giving back to the Connecticut community and making it a better place to live. 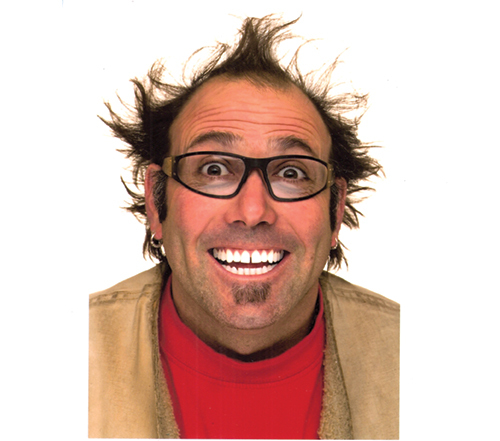 Born Jeffrey Alan Rumaner, but living under the internationally trademarked moniker “STRETCH”, is an Artist, Entrepreneur, Restaurateur, TV Personality & the visionary creator of Grinders Pizza. Grinders Restaurants, CrossroadsKC @ Grinders, (USA Today’s #1 Pick for “Best Kansas City Nightlife”) and even their retail support “sister company,” STRETCH Specialties, LLC, which creates and sells Grinders Signature Hot Sauces, T-shirts and other fun merchandise, have each gained world-wide notoriety, thanks in part, to owner STRETCH’s appearances on hit television shows like: Food Network’s Diners, Drive-Ins & Dives; Guys Big Bite; Cutthroat Kitchen; Travel Channel’s “Pizza Paradise”, Spike TV’s “Bar Rescue”, Animal Planet’s “Eating the Enemy,” Discovery Channel’s Monster House, Destination America’s BBQ Pitmasters, and even ABC’s Extreme Makeover: Home Edition. STRETCH has twice toured with Guy Fieri on his national “Foodapalooza Roadshow” and the South Beach Wine and Food Festival, showcasing his custom-made 25-gallon Monster Margarita Machine. STRETCH continues to tour the globe several times a year, entertaining & feeding US military personnel with Messlords, a globetrotting troop of fellow celebrity chefs. In its first years of business, Grinders Signature Hot Sauces has won more than 25 prestigious awards & honors, including 2015 Screaming Mimi’s – from the New York City Hot Sauce Expo, Peoples Choice Awards at Houston Hot Sauce Festival, multiple 2014 International Scovie Awards; appearing on CBS’s 60 Minutes, CBS New York, NBC Albuquerque, and has become available in hundreds of stores around the world, like Whole Foods Markets, Bed, Bath & Beyond & many specialty stores, not to mention quite a few military bases, including ones in Guantanamo Bay, Cuba [GITMO,] Guam & Japan. In 1991, he opened his sculpture studio in a run down area south of downtown Kansas City, now called the “Crossroads Arts District”. His passion for transforming this blighted neighborhood was all encompassing, as he solicited other artists, entertainers, gallery owners and entrepreneurs to move into the neighborhood and open businesses. Before STRETCH, there were two art galleries, and now there are over 70. Before STRETCH, there were only 2 hamburger stands & a Mexican food restaurant in the entire district, and now there are over 50 restaurants. These efforts in the early days earned him the nickname, “The Mayor of the Crossroads” and he began serving on many organization’s Boards of Directors, culminating in a 2006 “Urban Hero Award,” presented by the Downtown Council of Kansas City, Missouri. Then, in 2009 was appointed by then Kansas City, Missouri Mayor Mark Funkhouser to the prestigious and occasionally controversial Tax Increment Financing (TIF) Commission, where STRETCH worked to ensure greater transparency and access for small businesses.